AFRICA/ZIMBABWE - Christian leaders: "we want to contribute to the peaceful development of the electoral process"
Harare (Agenzia Fides) - Religious leaders from different church bodies under the Zimbabwe Heads of Christian Denominations (ZHOCD), called on the government of Zimbabwe to promote peace and reconciliation in the country at a Conference held in Harare from 28-30 May 2018, under the theme, “Religious Leaders Supporting the Zimbabwe Peace Process”. The Zimbabwe Catholic Bishops’ Conference (ZCBC), Evangelical Fellowship of Zimbabwe (EFZ), Zimbabwe Council of Churches (ZCC), Union for Development of the Apostolic Churches in Zimbabwe (UDACIZA) and the American Friends Service Committee expressed concern on issues of peace and reconciliation as Zimbabwe prepares for the harmonised elections to be held on 30 July 2018 announced by interim Head of State Emmerson Mnangagwa. "The main thrust is to enhance the church’s participation in peace processes through such initiatives as dialogue, mediation, peace and reconciliation leading to national transformation with major highlights coming from the collaboration of Commissions such as the National Peace and Reconciliation Commission (NPRC), Zimbabwe Human Rights Commission (ZHRC), Zimbabwe Electoral Commission (ZEC) and the Zimbabwe Republic Police (ZRP)", said Paul Muchena, National Coordinator for the Catholic Commission for "Justice and Peace". The conference discussed about capacities critical for sustaining peace and reconciliation especially considering that the country’s past elections were always characterised with violence and blood shed. 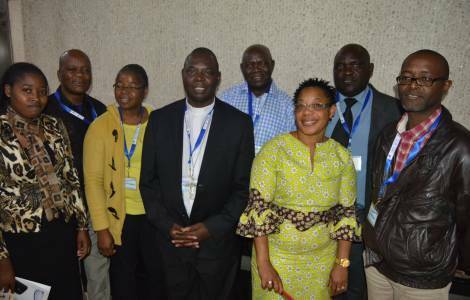 The Religious Leaders took some time to learn from experiences of other Countries in the Region such as South Africa, Burundi, Togo, and Kenya on how to facilitate peace and reconciliation. His Exc. Msg. Rudolf Nyandoro Bishop of Gokwe and President of "Justice and Peace", warned about the dangers of pronouncing derogatory statements, hate speeches and slogans that divide people and ultimately lead to violence or bloodshed. He encouraged political parties to desist from such practices and to choose words that unite rather than divide people. "In our political sloganeering, we have wished our political opponents dead. Literally, it would also mean wishing God dead since everybody was created in his image", he warned.